Crosslake, MN (April 9, 2019) – You know the old adage: A bad day fishing beats a good day . . . But what if you could be on the water—or, even more interesting, go underwater—while at work? 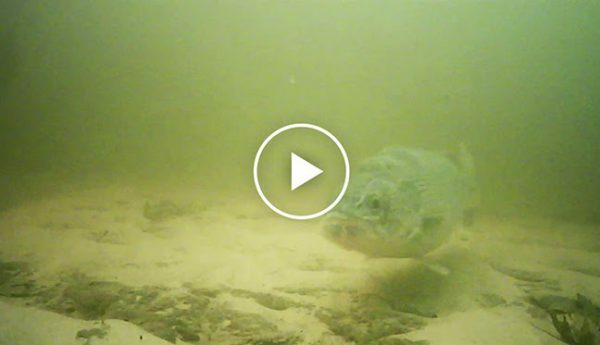 One of the coolest ways to feed your need to fish, right from the comfort of your cubicle, Wolf River Cam plays an around-the-clock live video stream of underwater fish migrations. Each spring, the mega-popular fish cams showcase walleyes, sturgeon, and a variety of other cool species swimming past the lens. Right now, legions of walleyes are making their annual spawning trek, followed by prehistoric lake sturgeon a week or so later. New Multi-Vu HD System features Auto-Clear Technology, optimizing underwater visibility in all water conditions. For the past decade, underwater camera innovator Aqua-Vu has provided the optics and ultra-clear video images at each of three different monitoring sites via www.wolfrivercam.com. Click and scroll down the page to see the HD video feed. Bunnell notes that in addition to watching the live underwater action at wolfrivercam.com or ustream.tv, folks can also download the Ustream app and watch the fish parade on their wireless device. Now in its eleventh season, Bunnell says he’s been amazed by the performance of the Aqua-Vu cameras. “We’ve used the Aqua-Vu systems for hundreds of continuous hours in extreme conditions without any problems. That’s way more time or abuse than a single angler could ever use an Aqua-Vu in a lifetime of fishing. New third generation HD Aqua-Vu cameras feature exclusive Auto-Clear Technology, specialized firmware that auto-adjusts the underwater image, even in dark and stained water. The result is a super-refined, clarified underwater video image, altered as light, color and clarity conditions change. New Aqua-Vu HD series cameras also feature refined low-light sensors that preserve a bright, clear picture, even as light fades by depth, and during low-light periods. Pre-loaded on all Aqua-Vu Multi-Vu Pro, HD10i Pro, HD10i, HD7i Pro and HD7i high-definition underwater viewing systems, visibility enhancing AutoClear Technology allows anglers to view underwater habitat even in darker, dirtier water environments. Fin-tech Fishing Team / NPAA members excel at the inaugural AIM Pro Walleye Series event out of Bay City Michigan! !